During an interview about student involvement on campus over the summer, rising junior, Laura Johnson, was asked about her job in the Advancement office. As a Business major, Johnson wanted to take this opportunity to learn more about the Gift Giving Development process, satisfy her nagging parents, as well as get her foot in the door for her dream career, asking for money and getting it. However, due to the 25 other Case Interns hired by the same office, little work come Johnson’s way, so she’s taken up a new path. When asked about her responsibilities, Johnson responded, “I usually get in around 8:30am, check to see if there’s anything I can do, and when there’s not, I sit in my cubicle and start swiping. 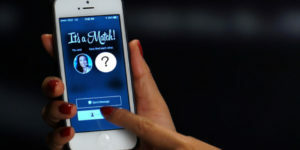 Tinder’s alright, but Bumble is totally the way to go.” In the past 2 months, Laura has clocked in a total of 205 hours at the office, which translates to approximately $1,435 and 445 matches. “My official title is ‘Case Intern’, but my real title should be ‘3rd Base Intern.’ I mean, I’m basically getting paid to date,” said Laura. Senior Kt Thomas is a satirical columnist. Her email is kthomas@fandm.edu.